9. Save your master page and open your SharePoint 2010 site. You should see your Custom SharePoint 2010 Global Navigation. 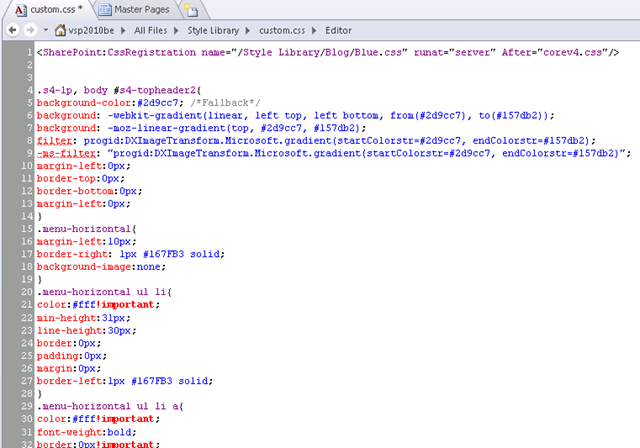 Hey virtualizesharepoint, great blog and cool to see my Css in use here, thanx for linking to the source. See ya around. Instead of Doing copy and past goto the site settings > Look and Feel > Master Page > URL Of CSS and select apply to all subsites. it wont require to modify the master page to attach css. If JS files are there then it require or else JS files can be include in Webparts.